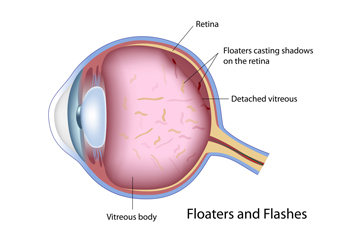 Floaters are actually tiny clumps of gel or cells inside the vitreous, the clear gel-like fluid that fills the inside of your eye. While these objects look like they are in front of your eye, they are actually floating inside it. What you see are the shadows they cast on the retina. Floaters can appear as different shapes such as little dots, circles, lines, clouds or cobwebs.